Two polls this morning: Abacus shows that the Liberals have essentially erased the gap with the Tories, with the NDP down to 24% nationally. 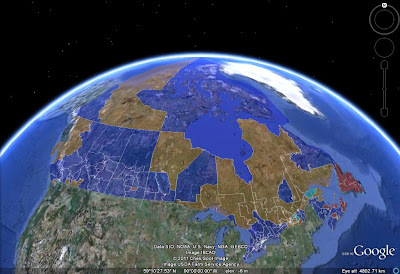 The silver lining for the NDP is that its drop seems to have stopped in Québec. That's just in time: at 28-30% the NDP still has a good chance to win a majority of Québec seats. The good news for the Liberals is that they are ahead by 7 points in ON, while the Conservatives lead by 8 points over the Liberals in BC (though I would guess that the NDP's 3rd place there is mainly due to a small sample in BC). 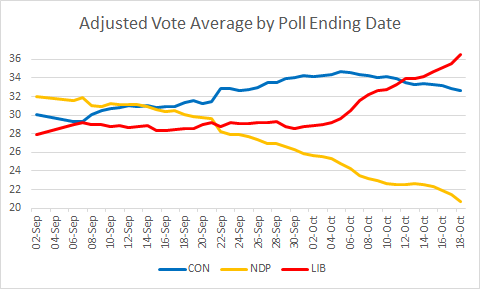 The unadjusted poll average is slightly kinder to the NDP and less generous to the Liberals than implied by the four polls above mainly due to some remaining weight on last week's polls (particularly Mainstreet, Angus Reid and Forum). 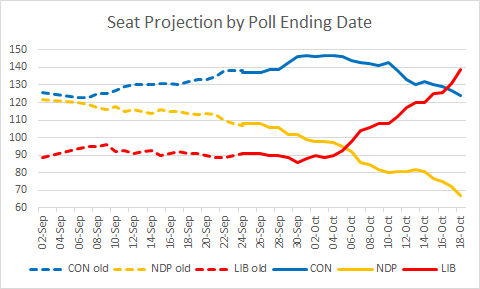 Their effect will continue to gradually fade with time, so if this week's polls are further confirmed, the NDP will slide slightly further, and the Liberals will gain a few more seats.